Isla Mujeres has long been a popular destination for water sports enthusiasts. With beautiful white sand beaches, crystal clear turquoise waters, magnificent reefs near-by and challenging deep-sea fishing, Isla has something for everyone. Explore the natural wonders of the Mexican Caribbean. There are beaches all around Isla Mujeres. The major beaches are on the north and west sides of Isla. Calm, turquoise waters and soft white sand make them ideal for sunning, swimming and snorkeling. The spectacular and rocky eastern shore is too dangerous for swimming, the currents are very strong on the Caribbean side. There are posted warnings, but accidents can happen so please be careful and always supervise your children. Playa Norte (North Beach) is considered one of the best beaches in the Caribbean and it deserves the honor. The soft white sand, palm trees and water so blue the sky looks pale, make it the perfect place to relax and unwind from the rigors of life. There is almost no current and you can wade out very far with the water still only coming to your waist. In front of the hotels on Playa Norte there are beach bars offer lounge chairs and umbrellas (for a fee) with waiter service on the sand. You can also rent water toys, kayaks and snorkeling gear. Playa Media Luna is a small, beautiful, curved beach just around the eastern bend of Playa Norte. There are no beach services and it is too dangerous for swimming because of the strong currents there. These more secluded beaches are located on the west side of Isla Mujeres facing Cancun, mid-island near Hacienda Mundaca. There are open air palapa restaurants, gift shops, bathrooms, chairs and umbrellas. You can also rent kayaks, canoes and even beach toys for the kids. 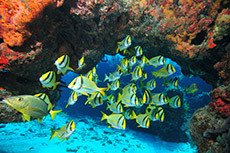 Snorkeling tours around the island are very popular and can be booked with most of Isla’s dive shops. The Cooperativa Isla Mujeres with their small brightly colored boats is a fun way to go. They are the first cooperative of tourist services registered in the state. They have been in operation for more than 38 years and are now in their second generation of tour operators. Guadalupana Tours with Tony Garcia is also a great snorkel tour operator, he will entertain you with stories about growing up on Isla Mujeres. 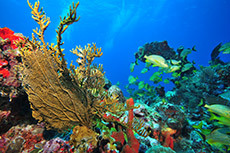 Nancy Tours also offers snorkeling tours in addition to fishing trips. On Isla Mujeres a snorkeling trip for you that you will always remember! Yas Adventures - snorkel tours to MUSA and Manchones reef and private sunset tours. Most tours provide snorkel equipment with an optional buffet lunch. The diving around Isla Mujeres is unforgettable. 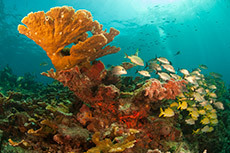 The Manchones Reef begins just off of Isla's shore and the Cuevones and Banderas Reefs are close by. The waters are calm and clear - perfect for the beginner as well as the advanced diver. The Cruz de la Bahia (Bay Cross) was planted into the Manchones Reef in 1994 to pay tribute to the men and women of the sea. 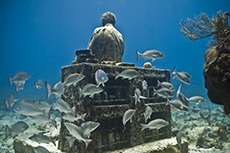 Divers celebrate the founding of Isla Mujeres in 1854 with a mass dive on August 17. For advanced divers there are wreck dives, drift dives, and night dives. During the Sailfish season (December to June) divers have the opportunity to witness twenty, forty or even more Atlantic Sailfish in an organized feeding frenzy of sardine “bait balls”. There are only a few companies that can safely offer this unique opportunity. 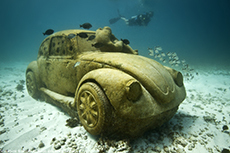 The crystal clear waters surrounding Isla Mujeres is home to the largest underwater museum on the planet. 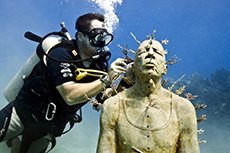 The artist, Jason deCaires Taylor is also the founder and artistic director of MUSA (Museo Subacuático de Arte/Underwater Museum of Art). In collaboration with marine biologists and other experts, the sculptures are all designed to counteract the effects of climate change on our oceans and reef systems. 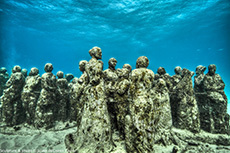 The sculptures will be changed in their appearance over time, as coral grows and marine life establishes itself. MUSA is a work-in-progress and was formally opened to the public on November 26, 2010. It will ultimately consist of 12 galleries containing nearly 1,364 artificial habitats. 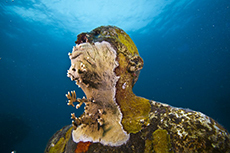 To date the underwater museum comprises of; La Evolucion Silenciosa (The Silent Evolution), Coleccionista de los Sueños (Dream Collector), Hombre en Llamas (Man on Fire), La promesa (The promise), Inercia (Inertia), Anthropocene, Herencia (Inheritance), and Vacio (Void) — all created by Jason deCaires Taylor. 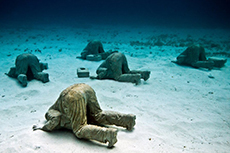 The sculptures were submerged to a variety of different depths throughout the national park and can be visited either by snorkeling or scuba diving. Silent Evolution can also be seen from a boat on the surface where the 400 pieces form the silhouette of an eye. Swim with dolphins at Dolphin Discovery on Isla Mujeres. An experience of a lifetime! Swimming with the dolphins is everything you have imagined and more. Everybody will delight in this hands-on experience, listening to the dolphins sing, watching them "tail walk", and even hugging and kissing these people-loving creatures. Choose from Dolphin Encounter, Dolphin Swim Adventure or Dolphin Royal Swim. You can also combine them with a Garrafon Reef Park package. The packages include use of the facilities; lockers, showers, swimming pool and lounge chairs, an open bar and buffet. The current price to enter but not swim with the dolphins is $30 usd. This includes use of the facilities, open bar and buffet. Not included in the packages are photos of your Dolphin swim. If you want photos, get the exact price from the photo concession before your swim. Remember to only wear biodegradable sunscreen. If you are lucky enough to visit Isla Mujeres during the summer months (June to mid-September), you’ll have the opportunity to participate in an incredible event - swimming with Whale Sharks in their natural habitat! 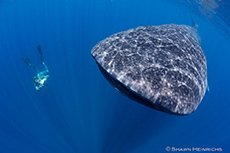 Although massive, Whale Sharks are docile and harmless, happily doing their own thing as snorkels float around them. To be in their presence is a privilege and an experience you will never forget. These gentle giants are the world’s largest fish reaching lengths of 46 feet (14 meters) and weighing up to 15 tons. The average size is 25 feet (7.5 meters) and the females are larger than the males like most other sharks. They reach maturity at 30 years and it has been estimated that they can live up to 150 years. 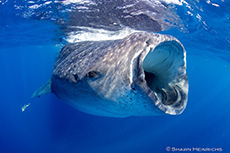 Whale sharks are filter-feeders, swimming with their wide mouths open, collecting plankton algae, krill, and sometimes small squid or small fish. The are usually solitary creatures, another reason that the yearly gathering near Isla is a very special event. 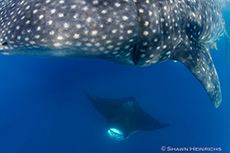 The peek times of the whale shark season is July and August with the Annual Whale Shark Festival taking place in July. The official price set by the official regulating bodies is $125 USD minimum per person and usually includes: a light breakfast, water and soda, ceviche lunch or sandwiches, snorkel gear and life vest and some additional snorkeling at a reef near Isla on the way back. Some tours that offer additional amenities might charge more. The rules and regulations guiding Whale Shark tourism are in place to protect the participants and the Whale Sharks themselves. Only trained and licensed tour operators are allowed to take people in small boats, boats over 33 feet are not permitted to enter the area and only 2 people plus a guide are allowed in the water at a time (per boat). Beware of anyone who offers you a lower price or who claims they will allow you to violate the rules. The Mexican Army is charged with enforcing rules and can detain boats who are not in compliance or violating the rules. Your day will be wasted and its doubtful you'll get your money back. Follow the instructions of your guide at all times. Isla Mujeres has been called "a fishing paradise," a place where double digit fish days are the norm, not the exception! The beautiful turquoise blue waters are excellent for fishing; even beginners can be sure to make a catch. There are plenty of alternatives to choose from; take a journey into the open waters of the Caribbean to go deep sea fishing - you’ll find Sailfish, Marlin, Dorado, and many more or take a colorful charter boat for a few hours or even a custom tour on a private yacht. You’ll find barracuda, grouper, red snapper and others year round and from April to August you have mahi-mahi, wahoo and tuna and of course countless Sailfish in the winter months. The island is host to quite a few local and international tournaments held every year. Of special note is the Island Time Fishing Tournament held in February with proceeds going to the Little Yellow School House. Sport Fishing with Captain Anthony Mendillo. Full and half days fishing aboard the KEEN M (41 ft.), the LILLY M (36 ft.), and the ANDREA M (35 ft.). All vessels have a full complement of electronics as well as all Coast Guard approved safety equipment and are fully equipped with the finest fishing gear and ready for the most exciting deep sea fishing and light tackle angling adventure in the waters of the Mexican Caribbean! Sport Fishing Center offers deep sea fishing, bottom fishing, inshore and spear fishing. 26, 29 and 33 foot boats. Sea Hawk Fishing offers some of the best off-shore and deep-sea fishing trips. On Isla Mujeres Water Tours offers custom fishing trips. Cooperativa Isla Mujeres Tours offers off shore, inshore and bottom fishing trips. At the Cooperative you can charter a boat for a few hours or day. You can even combine some fishing with some snorkeling and a buffet lunch. Nancy Tours Isla Mujeres offers half-day or full-day charters. Guadalupana Tours with Captain Tony Garcia offers trolling and bottom fishing. Capt. Tony is a favorite of many long-time visitors! 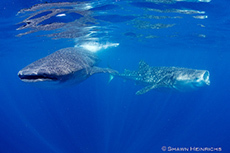 Swim with the Whale Sharks... a bucket list adventure! 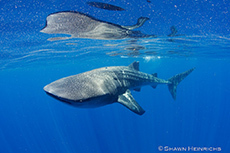 Photos by Shawn Heinrichs, Emmy Award winning cinematographer, photographer, scuba diver, and marine conservationist.